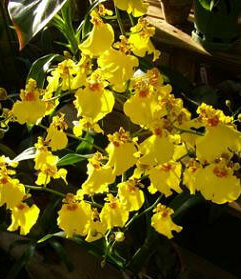 Oncidium is a large, diverse group of plants that includes over 600 species! 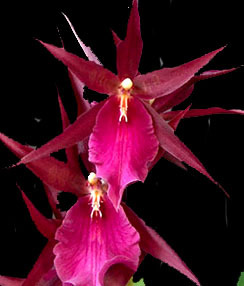 Their flower displays are among the most dramatic in the orchid world. Early explorers were spellbound by fields golden yellow, doll-like flowers moving gracefully in the wind. So the fiirst Oncidiums were called "The Dancing Ladies", as symbol of the beautiful, exotic dancers of Ceylon ( Sri Lanka). Oncidiums are characterized by their long, arching flower spikes that display a plethora of flowers. A single plant can produce multiple flower spikes, with each spike producing 10 or more blooms! Colors range from bright yellow to bronze, white with pink, and glittering shades of dark red. Some have hundreds of blooms on flower spikes over 4ft long! 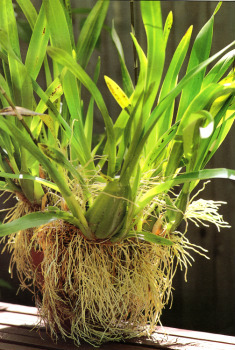 Nature has also equipped Oncidiums with a "storage tank" at the base of each growth called a pseudobulb. These pseudobulbs provide water for the plant during long dry periods between rain showers. In their natural habitat oncidiums grow in the air, attaching themselves to rocks or trees - they never grow in the ground. 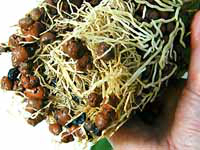 That's why you'll often see active roots growing outside the pot (see photo). The key to successfully growing any orchid is understanding the rhythms of their seasons and adjusting your plant care accordingly. This is particularly true for oncidiums. During their active growing season they want bright light (with some sun) and up to 2-3 times more water than other times. To prevent overwatering, these plants are usually planted in a coarse, fast draining media. This can make correct watering a challenge during the growing season. How can you be sure the plant is getting anything when the water runs through the pot so fast? 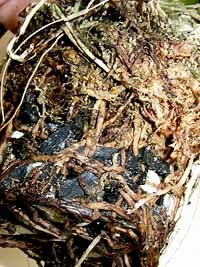 Soaking the root system at the sink or in a bucket of water is the only way. This is time consuming when you have more than a couple of plants. And if you water too often, the roots will rot quickly. Our hydroponic system has a water gauge for accurate watering and all media is replaced with LECA pebbles. LECA pebbles are ceramic and will never compact or decompose. Their capillary properties deliver the nutrient solution to the plant gently and evenly. And the water gauge tells you when and how much to water. Cool evening temperatures trigger the blooming season. After first flowers open move plant away from sun to prolong the blooming cycle. Don't worry, your plant has saved up all the energy it needs to complete its bloom cycle. 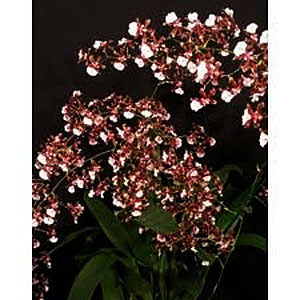 Each oncidium flower only lasts a couple days but these plants bloom sequentially, which means all the blooms do not open at once. Many plants have up to a hundred flowers so the overall flower display can last up to 2 months or more. After blooms have faded, move plant back to growing area and give it a rest. Less water and no nutrients. When new growth appears, increase water and nutrients. Oncidiums need several hours of direct sun every day to build up the energy to flower. Then, when the flowering cycle arrives, move plant away from the direct sun to encourage longer lasting flowers. 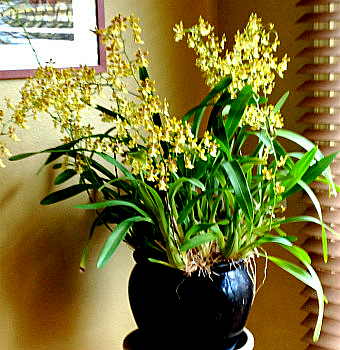 Hot sun deteriorates oncidium flowers quickly. During the active growing and blooming seasons, water to 1/2 on gauge (include nutrients). After the blooms have faded, cut back on water and nutrients. Water only until the gauge moves - then stop! No nutreints during this period. Lift inner pot to check for dryness. Plant can even sit dry for a week or more. Continue this watering schedule until you see new growth, which signals the start of a new season. Oncidiums prefer cool with night time temperatures in the 50-60 degree range. With good air circulation temps can reach 90 during the day. Remember, cool nights (along with good light during the day) initiates flower spikes. Cool temperatures away from sun also prolongs the life of the flowers.